December 8, 2015 CSH Mine sends warmth to the herdsmen suffering from the snow disaster. Urat Middle Banner located close to the CSH Mine has recently suffered from an unusually large snowstorm. The life and production activities of local herdsmen have been seriously affected, and a large number of animals lacked food to get through the winter. Local roads used by herdsmen have become unusable and covered by snow. To help with this situation, CSH Mine purchased, arranged the shipment of and donated 40 tons of maize to help the herdsmen. The sheep can be saved, thanks to CSH, said Bateer, a local herdsman. Mr. Lisheng Zhang, Chairman of IMP, has also ordered a road cleanup effort to help the herdsmen. Large machinery from the crushing plant was deployed to clear the snow on local roads. Over its entire existence the CSH Mine adhered to the concept of harmonious win-win practices of bring benefits to the local communities wherever it operates. IMP has made contribution to local economic and social development and has received numerous recognition and praise from the local government and herdsmen. August 19, 2015 Mr. Bing Liu, CEO of China Gold International Resources Ltd. visits CSH Mine. On August 19, 2015 Mr. Bing Liu, deputy general manager and chief accountant of China National Gold ("CNG"), and CEO of China Gold International Resources ("CGG" or " the Company"), visited Inner Mongolia Pacific Ltd. ("IMP"), the subsidiary of CGG and the operator of the Company's CSH mine. Mr. Liu examined the explosive plant, the cyanide warehouse, a water source area and the Phase II leach pad. Mr. Lisheng Zhang, chairman of IMP presented a detailed report on production and operation, management of hazardous chemicals, slope treatment, geological exploration, cost control and performance enhancement, technological innovation, construction of segment C of Phase II leach pad and other matters. Mr. Bing Liu spoke highly of the achievements of IMP in production and operation, safety and environmental protection, and fully affirmed great results that IMP achieved in management of hazardous chemicals, finance management, scientific and technological innovation, and other. He emphasized the importance and urgency of safety production after the explosion in Tianjin, and gave specific requirements about transport, storage and usage of dangerous chemicals: 1) strictly implementing and being in compliance with relevant laws, regulations and procedures on transport, storage and usage of dangerous chemicals; 2) learning a lesson from the explosion in Tianjin and investigating rigorously potential safety hazards in transport, storage and usage of dangerous chemicals of IMP and preventing accidents; 3) penalizing those who violate the law in regards to transport, storage and usage of dangerous chemicals and assuring safe production; 4) making determined and persistent efforts to ensure completion of the annual production target, concentrating on the construction of digital mine site, marketing IMP's achievements and expanding social impact of the Company. August 17, 2015 CSH Mine Receives Prestigious Industry Recognition. China Gold International Resources Corp. Ltd. (TSX: CGG; HKEx: 2099) (the "Company" or "China Gold International Resources") is pleased to announce that the Company's CSH Mine, was named "Top 10 Producing Gold Mines in China" and "Top 10 Economic Performance Gold Mines in China" in 2014 by the China Gold Association. CSH Mine was ranked No. 5 in the "Top 10 Producing Gold Mines in China" list and No. 9 in the "Top 10 Economic Performance Gold Mines in China" list. This is the second time the mine receives this honor since 2013. In 2008 China National Group ("CNG") became a shareholder of the CSH Mine and turned the operation into a consistently profitable and growing gold mine. Gold production at CSH increased from 1.77 tonnes in 2008 to 5.1 tonnes in 2014; revenues increased from 352 million RMB in 2008 to 1.178 billion RMB in 2014; net income reached 304 million RMB in 2014 and gold resources increased from 55.96 tonnes in 2008 to 126.6 tonnes in 2014. August 12, 2015 China Gold International's directors visit CSH Mine. On August 12, 2015, Messrs. Ian He, Yunfei Chen and Greg Hall, independent directors of China Gold International Resources Corp. Ltd. (TSX: CGG; HKEx: 2099) (the "Company" or "China Gold International Resources"), visited the company's CSH Mine ("CSH") to review mine site operations. They examined the dispatching command center, Phase II heap leaching fields and other operations. A working meeting and a Health, Safety and Environmental (HSE) meeting were held. Mr. Xiangdong Jiang, general manager of CSH and Mr. Xiuren Zhang, deputy general manager of CSH reported on CSH’s production and operating results and HSE work during the first half of 2015. Numerous questions from the independent directors were answered by Mr. Lisheng Zhang, Chairman of CSH and the managers from related departments. Mr. Jiang Liangyou, Senior Executive Vice President of the Company, Mr. Jerry Xie, Executive Vice President of the Company, Mr. Lin Jiang, of the Company’s department of production technology and other management of CSH accompanied the independent directors. All independent directors were highly satisfied with the inspection and praised CSH’s operational and HSE achievements. August 8, 2015 China Gold International's directors visit Jiama Mine. On August 8, 2015, Messrs. Ian He, Greg Hall, independent directors of China Gold International Resources Corp. Ltd. (TSX: CGG; HKEx: 2099) (the "Company", "CGG" or "China Gold International Resources") and other delegates visited the company's Jiama Mine ("Jiama") to review mine site operations. They were accompanied by Mr. Liangyou Jiang, chief engineer of China National Gold ("CNG") and senior executive VP of CGG, Mr. Ping Wang, Chairman of Tibet Huatailong ("HTL"), the subsidiary of the Company and the operator of the Jiama Mine, and by other representatives from CNG and CGG that are responsible for HTL. Extensive examination of and Q&A session related to production and operation, resources development, science and technology, safety and environmental protection, active social responsibility performance, costs and grade and recovery management were held. The directors were highly satisfied with the inspection and praised Jiama's management and people operating in naturally challenging conditions of high altitude. Several recommendations were given to management for further strengthening the performance of the mine. China Gold International had a successful Annual General Meeting of shareholders (the “AGM”) on June 30, 2015 in Vancouver, Canada. At the AGM, shareholders considered and approved all resolutions. Directors and Management of the Company elaborated on Company's vision and growth plans and answered shareholder's questions. You can find more information about the Company, and review the AGM materials by visiting the following link: http://www.chinagoldintl.com/investors/agm/ or on SEDAR at www.sedar.com. May 28, 2015 China Gold International's Jiama Mine is named “CSR (Corporate Social Responsibility) Model Enterprise”. China Gold International Resources Corp. Ltd. (TSX: CGG; HKEx: 2099) (CGG) is pleased to announce that on May 28, 2015 Tibet Huatailong Mining Ltd., the wholly-owned subsidiary of China Gold International Resources Corp. Ltd. and the operator of Jiama Mine, was named “CSR (Corporate Social Responsibility) Model Enterprise” by the Corporate Social Responsibility (CSR) Research Center of Chinese Academy of Social Sciences (CASS). Tibet Huatailong is the 8th “CSR model enterprise” selected by CASS CSR Research Center and is also the only enterprise to receive such honor in Tibet. Under the guidance of the State-owned Assets Supervision and Administration Commission of the State Council of the People’s Republic of China (SASAC), the CASS organized a comprehensive CSR inspection panel and inspected the Jiama Mine. The CSR inspection panel included some of the most prominent leaders of the industry and the government, such as: Xiaodong Hu, Vice President of the CASS CSR Research Center, Bao Si Ri Gu Leng, Jun Lu, head of comprehensive department of SASAC News Center, Dengfeng Shi, Deputy Director of Mineral Resources Development and Management Division of Minister of Land and Resources, Jie Wang, Deputy Director of CASS Economics Department of the CSR Research Center as well as other leaders and experts from well-known domestic and international enterprises, such as the Aviation Industry Corporation of China, China Southern Power Grid, China North Industries Group, China Electronics, China Huadian Corporation, China Energy Conservation and Environmental Protection Group, Samsung (China), and Xinxing Cathay International Group. Phunsukh Wangdu, the party secretary of Jiama town, Xiaofen Wang, head of Jiama town, senior management, department heads and over 400 employees of Tibet Huatailong attended the ceremony. May 11, 2015 Mr. Lisheng Zhang, Vice President of China Gold International Resources, receives prestigious government recognition. China Gold International Resources (the "Company") is pleased to announce that Mr. Lisheng Zhang, the Company's Vice President and the Chairman of Inner Mongolia Pacific Mining Co. Ltd., a subsidiary of the Company, which owns and operates the Company's CSH Gold Mine, was awarded the "Exemplary Executive, 2015" title from the Inner Mongolia Autonomous Region's Government. Mr. Zhang joined the Company on September 12, 2008. Under the leadership of Mr. Lisheng Zhang, his team rapidly expanded the CSH Mine into a technologically advanced and profitable 60,000 tpd. operation, thus helping to grow China Gold International into a world-class mining company. The Company and the awards committee praised Mr. Zhang as a dedicated, conscientious, humble, pragmatic and self-disciplined leader, who constantly enhances team building and empowers employees for continuous growth. In 2014, Mr. Zhang was also awarded the "May 1st Labor Medal" granted by the Inner Mongolia Autonomous Region Government. April 28, 2015 Not only we are building mines, we are building communities. In addition to succeeding in growth, cost savings and profitability, our company also enhances the quality of life of those communities where we have presence. For many years in a row, in conjunction with the local communities, the Company has been planting native trees around the Jiama and CSH Mines. This year we made this initiative even more special by asking every employee of the company to personally purchase or, as we say, “adopt” a tree for Jiama. We could not expect a better response! Generous donations poured in from our employees worldwide towards this cause. Those employees who were on site at that time volunteered to plant the trees. We are sharing a few pictures of tree planting at our green Jiama Mine. 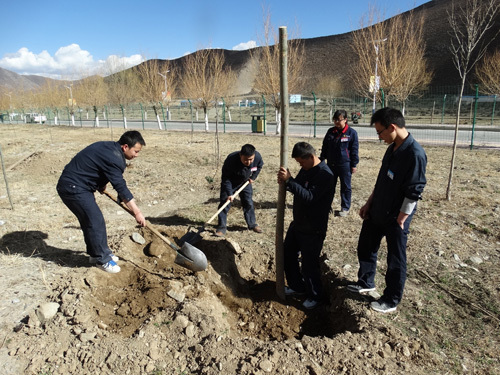 Since we entered Tibet in 2010, we have prioritized hiring and training of local employees. At the moment about 35% of our workers in Tibet are locals. We established a successful joint venture between our Jiama mine and the Jiama village. 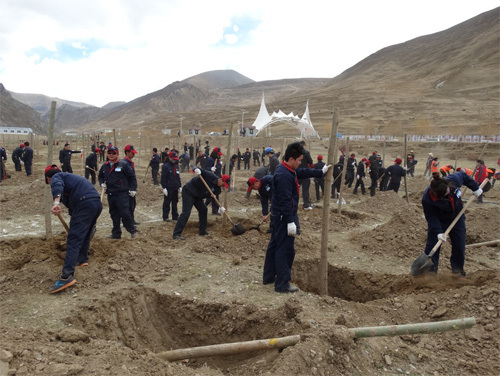 About 655 local Tibetan households in the Jiama village enthusiastically chose to be the shareholders in this joint venture and work in various positions (including a vice-president level position) at our beautiful green Jiama Mine. This raised their level of income by about 12 times and also empowered their professional growth through participation in training programs that our Company runs. Those efforts are just one example of what we call a “triple-win” situation for our community, shareholders and the Company. On March 26, 2015, in Hong Kong, Management of China Gold International Resources held an event to announce the 2014 Annual Results of The Company. The event was followed by numerous one-on-one meetings with analysts, investors and other financial and industry professionals in Hong Kong and Singapore.